Meeting and Assistance on Arrival at Delhi Airport and transfer to hotel. 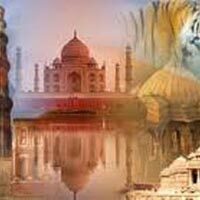 Depending on the availability of time, you will be taken for a half day sightseeing tour of Old Delhi. Overnight stay at Delhi. You will be taken for the Delhi sightseeing. Humayun Tomb, Qutub Minar, Lutyen’s building – the buildings which were designed by the British architect Sir Edwin Lutyens. Overnight Stay at Delhi. Post breakfast, you will be driven into the Pink City via the deserted city of Fatehpur Sikri and the Bharatpur Bird Sanctuary and check in to the hotel at Jaipur. Spend the remaining day at leisure. Overnight stay at Jaipur. You will be taken for a full day sightseeing. Ascend Amber fort and on the elephant back in the morning, visit City palace, Hawa Mahal, Royal Museum and Observatory. Overnight stay at Jaipur. You will be transferred to Jaipur Airport for your departure. We sincerely hope that you made wonderful memories in this tour. We hope to see you soon!